The task is to import every file that is dropped into a specific folder on my local drive into NAV. The solution is a windows service programmed in Visual Studio 2008 VB.NET. The first step is to create a web service in Dynamics NAV that accepts a text line and a file name. Another function to remove the file if the import fails and the third to process the file after it has been imported. ‘ before the method ends. ‘ Add code here to perform any tear-down necessary to stop your service. where CommondialogMgt is Codeunit 412 to ask the user where to save the file. If I passed a default file name to this function and the user simply approved the suggestion I would get the same result as if the user pressed cancel. I wanted to change this and added a few lines to Codeunit 412. I added a global function SetProperties and GetFileName and a local function OpenFileWithError. and I will get an empty file name if cancel is pressed. 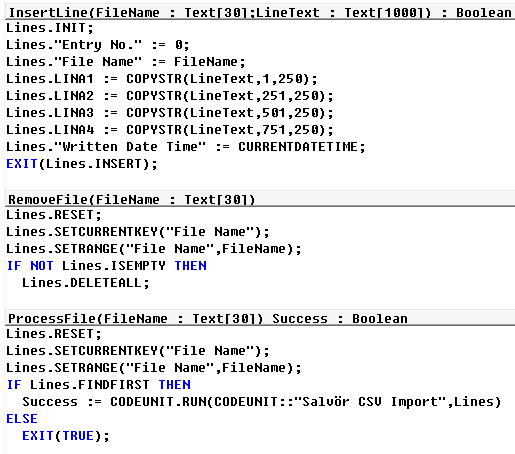 Attached is the NAVW16.00.01 Codeunit for NAV 2009 R2. In one of my solutions I create a lot of Excel and PDF documents. All these documents are stored in BLOB fields and then downloaded to the client computer temporary folder and opened for the user. Every time I use the ClientTempFileName function in Codeunit 419 a file is being created in the client computer temporary folder and that file is not deleted until the Role Tailored Client is closed. Since the user is creating temporary files his whole workday I decided that a single instance codeunit would be a better way to store information about the client and server temporary file paths. I created codeunit 50060 and two functions; GetClientTempPath and GetServerTempPath. [code htmlscript=”false”]OBJECT Codeunit 50060 Application Temp Path Mgt. My earlier post on File Download used the responsestream property of WinHTTP. On my latest project I needed to use Windows Authentication on my website and found out that I needed to create the WinHTTP automation on client level to login with the current user. This also means that I cannot use built in streaming functions to download the file. Instead I used ADOStream function to download the file and in the example that follows I am saving the file to the temporary directory for the current user. By using the Automation “‘Microsoft Shell Controls And Automation’.Shell” you can unzip a file within Dynamics NAV. In the Role Tailored Client all file system commands used by the Classic Client have been removed. For those who have been using commands such as EXISTS, RENAME and ERASE there is a code update to be done. I created a codeunit that includes these functions and can be used to replace the commands in the old code. These functions work both in the Role Tailored Client and in Classic Client.